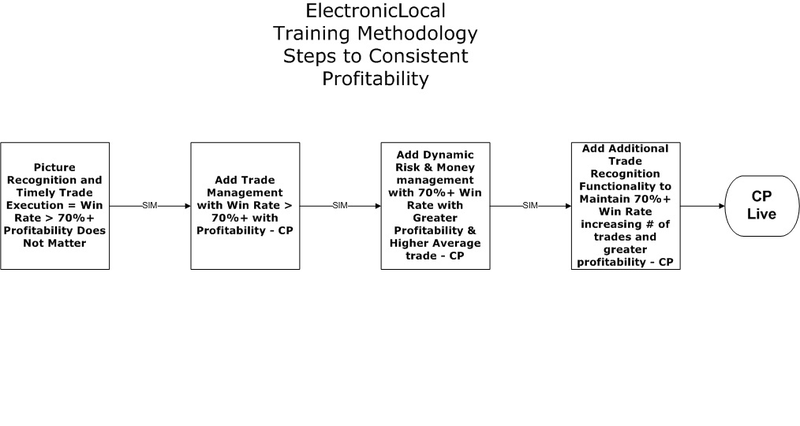 In response to quite a few emails, I'm setting out a high level summary of the process involved in getting to Consistent Profitability. I've condensed a lot of the information in the blog as well as leaning on what is in the videos of the training I just completed. I've come up with a high level description of what and how I teach, and this will be what attendees will see in the MarketDelta seminar in Chicago. Those not attending can use this summary, together with the blog (with or without the DVDs) to create their own trading and training plans. Take a blank chart and then add the range bars - discuss why use the range bars and demonstrate how to set them up. Add each chart component- describe why it's there, what it does and how to use it. Switch to Market Profile - show how to set up and split the profile into distributions,what it all means and why. Work through the envisioning process- why I do it, how I do it and what I do when its wrong. Go through each of the 12 long and 12 short pictures (setups with nuances) that I trade, showing as many examples as is needed for learners to take the information on board. This gives a trader all the necessary tools for trading. Use live markets to put theory into practice- start off with the daily preparation, envisioning and start trading. Think out load all day as the market is unfolding, I continually evaluate the market, talking about what "they" (nett market participants) are presently doing and what the likely consequence of that order flow is. Call trades live and then manage them, using the tools and techniques that I taught in the theory part of the training. This is learning by doing at the right edge of the chart. There is no where for EL to hide. Traders can see the learning in action, working live, losing trades and all. The basis of a new traders trading is a single market using a single chart plus Market Profile for context. Begin to trade only one picture type, picture with a very high win rate that is easily recognisable. Other pictures can be added after CP has been achieved- many people only need this one picture to earn a living for the rest of their trading career. Creating Trading Plans- I provide 7 trading plans that take the traders through all the stages and sub stages that make up the road map to Consistent Profitability. 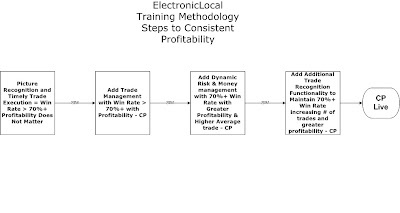 TPs used in SIM and when a consistent 70% win rate is achieved on each plan, the trader can move to the next, adding a higher level of profitability with each permutation. Go live but as an already CP trader in SIM. Much easier and cost effective than having to become CP in live for the first time. You can create this same regimen for yourself. You don't need me or anyone unless you want to considerably reduce the learning curve. This way of learning and trading really works. It builds a strong foundation and progressively adds to knowledge and experience in SIM so that skill and confidence are created simultaneously, building on previously built and tested skill and confidence. Using this methodology, people have become CP live in months. This doesn't mean that you can achieve this unless you put in the incredibly huge amount of work, hours and effort required as well as achieving the right mental attitude, discipline and focus. I have added the chart below which I have previously shown, because it shows this whole process. Today's recap is of the ES starting just over an hour before RTH commences. Sometimes I jump on a pre-Gap trade to get a better trade location. The video tells it all. Hi EL, Great commentary & a very useful post regarding the training. Thanks! One question - due to the technical limitations of the size of the video, would it be possible to post with a white chart background? I think this will make the detail on the charts clearer. Nick, I'll give it atry. Thanks for the suggestion. just doubleclick the video and you are redirected to youtube where you can watch it in HD and in fullscreen. It can't get any better! Fantastic work, Tom. Thanks a lot for the videos and your explainations. Is a decreasing completion time of the range bar a criteria for entries for you? I mean is it important for you that the completion time of the current bar is shorter than the completion time of the previous bar? Samer, Yes. The quicker the bars complete the stronger the momentum. Some constructive criticism (i hope) about the videos. You said about trade 1 "The market looked overbought"
You said about trade 2 "The market looked like it was going to bounce"
That's not terribly educational. Perhaps you couldn't be a little more specific, pointing to what made up that "look" for you. I realize that trading is discretionary and no 2 trades will look the same. I've heard that speech before. That's not my point. Point is, if your purpose is just to show the days highlights, ala Sportscenter, this is a fine video. If the purpose is to educate, perhaps my suggestion will be of help. BTW, your trade 3 description was a bit better in providing some detail. Brian, you can't imagine how time consuming the blog is. I'm trying to be helpful within the time I can devote to it. Everything is here in the blog if people work through it but I will bear your comments in mind. Thanks. Anon, to satisfy your curiosity, on the floor the largest was 4 figures. Now it's a lot, lot less. The markets are a lot more volatile. I used to trade the big S&P back in the 1980's in a size we called "a Hawaii" (from the TV show, Hawaii 50). Back then, if you made 1 handle on a trade it was $250 and a big move. Hi EL - so you were trading the big S&P in the 80's!!! That must make you one of the original YUPPIES! Is that good or bad? LOL. Keep it up.